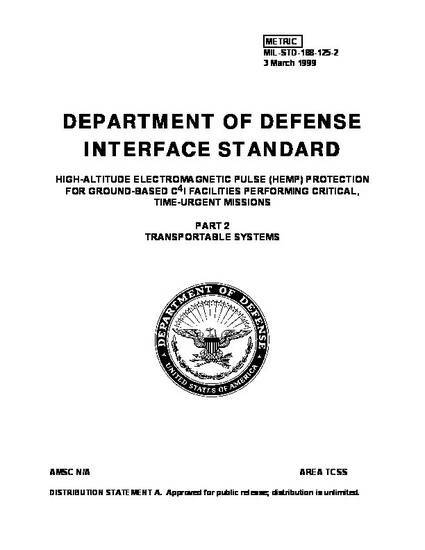 "MIL-STD-188-125-2, High-Altitude EMP Protection for Transportable Systems"
This standard establishes minimum requirements and design objectives for high-altitude electromagnetic pulse (HEMP) hardening of transportable1 ground-based systems that perform critical, time-urgent command, control, communications, computer, and intelligence (C4I) missions. Systems required to fully comply with the provisions of the standard will be designated by the Joint Chiefs of Staff, a Military Department Headquarters, or a Major Command. The standard prescribes minimum performance requirements for low-risk protection from mission-aborting damage or upset due to HEMP threat environments. The standard also addresses minimum testing requirements for demonstrating that prescribed performance has been achieved and for verifying that the installed protection measures provide the operationally required HEMP hardness for the completed system. If the prescribed testing results in any hardware damage or functional upsets, the operational authority for the system will make the determination whether the observed event is mission aborting. The standard defines the design and testing criteria for specifically designated transportable ground-based systems in HEMP-hardened, critical, time-urgent C4I networks. Such systems include subscriber terminals and data processing centers, transmitting and receiving communications stations, and relay systems. The standard applies to both new systems and modifications of existing systems. Although only local portions of system interconnects are addressed, it is assumed that survivable long-haul communications paths, fiber optic links, or other hardened interconnects between systems will be provided as required for mission accomplishment. The document provides a standardized, low-risk protection approach for transportable ground-based systems in HEMP-hardened C4I networks. These uniform requirements ensure balanced HEMP hardening for all critical systems and facilities in the network.